The 18th annual Kennett Brewfest is this weekend. This is a weekend for beer lovers and wine aficionados to celebrate because there are two wine festivals and a beer festival on the calendar. The 18th Annual Kennett Brewfest (600 S. Broad Street, Kennett Square, 610-444-8188, http://kennettbrewfest.com), which will be held on October 10, is a fundraising event with all proceeds going to Historic Kennett Square, a non-profit organization working to keep Kennett Square a regional economic and cultural center. The Kennett Brewfest is intended to be an opportunity to sample some of the best regional and national craft beers accompanied by great food and live music. All attendees have access to food and merchandise vendors, live bands, sponsor tables, and more during the entire event. Doors open at noon for the Connoisseur Tasting. The regular fest is slated to get underway at 2 p.m. All taps will close at 6 p.m. Participants’ tickets will be scanned at the entrance, where they will receive their tasting cup. Some of the featured beers will be locally-brewed favorites such as Kennett Brewing Company, Victory Brewing Company, Chaddsford Hard Cider and Twin Lakes. 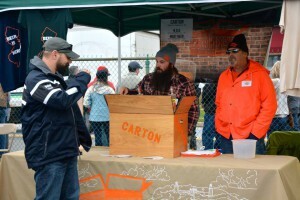 The long and impressive list of participating breweries includes Allagash, ABC, Anchor, Argilla, Armstrong Ales, Ballast Point, Ballentine, Bell’s, Big Hill Ciderworks, Blue Moon, Bold Rock Cidery, Boulevard, Blue Bus, Brooklyn, Cape May, Captain Lawrence, Carton, Conshohocken, Cottontail, Cottrell, Dark Horse, Deschutes, Destihl, Dock Street, Dominion, Duck-Rabbit, Evil Genius, Evil Twin, Evolution, Flying Dog, Flying Fish, Forest and Main, Forgotten Boardwalk and Frecon Cidery. Also featured will be Free Will, Full Pin, Goose Island, Great Divide, Great Lakes, Guinness, Heretic, Ithaca, Knee Deep, Kona, Lake Placid, Lancaster, Leinenkugels, Levante, Liquid Hero, Longtrail, Magic Hat, Magner’s, McKenzie’s, Merchant du Vin, Naked, Neshaminy Creek, New Belgium, Newport Storm, Old Forge, Ommegang, Oskar Blues, Other Farm, Otter Creek, Prak Organic, Penn, Prism, Red Castle, Riverhorse and Rivertowne. The line-up for 2015 also includes, Rogue, Round Guys, Samuel Adams, Saranac, Schofferhoffer, Shawnee Craft, Shiner, Shipyard, Sierra Nevada, Sixpoint, SlyFox, Sole Artisan, Springhouse, St. Benjamin, St. Boniface, Stable 12, Star Hill, Stillwater, Stone, Stoudt’s, Straub, Summit, Susquehanna, Thomas Creek, Three Heads, Tired Hands, Traveler, 2SP, Troeg’s, Two Roads, Weyerbacher, Woodchuck, Yards, Yuengling and Zero Day. Sipping crisp, chilled wines in a comfortable outdoor setting is a great way to spend a crisp, cool autumn afternoon. Fortunately, you have two good options to do that this weekend. On October 11, more than 1,500 wine lovers will gather to help wage war against cancer at the 24th Annual Dilworthtown Inn Wine Festival (Dilworthtown Inn, 1390 Old Wilmingtown Pike, West Chester, 610-431-5329, http://www.chestercountyhospital.org/cchfdn.asp?p=1210). The event kicks off at noon and runs until 4 p.m. — rain or shine. The festival features more than 100 wines, craft beers, hard cider along with delicious food prepared by Dilworthtown Inn chefs. There will also be a “Silent Auction,” shopping opportunities in the Gallery of Artisan Vendors, live music and a Performance Car Show. Tickets are $40 in advance and $45 at the door. 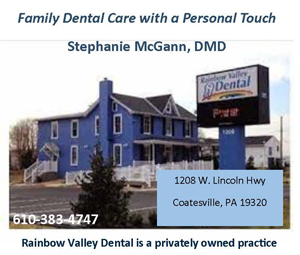 The Dilworthtown Inn, and the Brandywine and Greystone branches of The Women’s Auxiliary to Chester County Hospital jointly organize this event. Proceeds from the wine festival benefit patients of The Cancer Program of Chester County Hospital and Neighborhood Health. On October 10, the Sixth Annual Fall Wine Festival (Skippack Pike, Skippack, 610- 584-1155, http://winetober.com) will be held Saturday from 1-6 p.m. along the main street of the scenic village near the Skippack Creek in Montgomery County. Two of Chester County’s most popular wineries will be participating in Saturday’s event — Paradocx Winery and Chadds Ford Winery. And, there will even be a meadery — Stonekemp Meadery from Birdsboro. The list of participating wineries also includes Allegro Winery, Bee Kind Winery, Peace Valley Winery, Franklin Hill Vineyards, Benignas Creek Vineyard and Winery, Blue Mountain Vineyard and Cellars, Kog Hill Winery, Naylor Winery, Grovedale Winery and A’Dello Vineyard and Winery. Some of the featured food stations will be Bespoke Bacon, Sherri’s Crabcakes, Eurban’s Wood-Fired Gourmet Pizza, Horn & Hardart Brands, Mainland Inn and Over the Top Bake Shop. The following bands will be performing at the event — James Lauchmen Band, Brick Duo, Roman & The Hard Lickers, Dave Sounders, Bill & All Duo, and Dave Ling. Paradocx Vineyard will also be busy on its home turf this weekend. From 1-5 p.m. on October 11, Paradocx Vineyard (1833 Flint Hill Road, Landenberg, 610-444-9003, www.paradocx.com), will host its Seventh Annual Community Day — a free event designed to bring people from the area together. Everyone is invited to visit the winery, sample the goods of local food purveyors and check out the work of local artisans. It will feature 17 rarely-viewed N.C. Wyeth paintings in hallmark exhibit in CCAA’s Allinson Gallery. 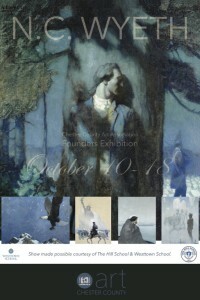 These impressive paintings by internationally acclaimed artist and CCAA Founder N.C. Wyeth will be exhibited from October 10-18 from 9 a.m.-8 p.m. daily (11 a.m.-6 p.m. on Sundays). Most of these works make up a unique and stunning set which is on loan from The Hill School in Pottstown, Pennsylvania. The only one form a different source is “The Giant,” which is on loan from Westtown School. Each of The Hill School’s 16 paintings illustrates a literary work by an American poet such as Walt Whitman and Henry Longfellow, and depicts a momentous event in our history. Under normal circumstances, “The Giant” can be found as the central attraction in the dining room of the Westtown School. As the largest painting in the Founders Exhibition, CCAA will enjoy the privilege of including it with the same central billing. N.C. Wyeth was a pre-eminent early 20th century painter who helped to establish the “Brandywine tradition” of painting. Admission to this exhibition is $15. In conjunction with this event, the Brandywine Artisan Wine Trail (http://www.brandywineartisanwinetrail.com) will offer a special attraction. To help promote this important exhibition, each of the Trail’s wineries will have art cards with one image from the N.C. Wyeth exhibition. If you collect five or more different cards, you can receive two-for-one admission at the door to the Chester County art show. If you write your name and contact information on the back of the card, you may be the lucky winner of a basket of Chester County wines from our area wineries. This art card collection game is free with no obligation to purchase anything. It is designed to encourage people to visit different wineries in the area, and go to the Chester County Art Association Exhibition. The wineries of the Trail are extending an invitation to come for the wine and enjoy the art. Members of the Trail are Black Walnut Winery, Borderland Vineyard, Chaddsford Winery, Flickerwood Wine Tasting Room, Galer Estate Winery, Grace Winery, Historic Hopewell Vineyards, Kreutz Creek Vineyards, J. Maki Winery, Paradocx Vineyard, Penns Woods Winery, Stargazers Vineyard & Winery, Ten Gallon Hat Winery, Va La Vineyard and Wilson Vineyard. This weekend’s schedule also features two long-running fall festivals that have become area traditions — the Friends Fall Festival at the Downingtown Friends Meeting and the Hay Creek Apple Festival at Historic Joanna Furnace. One of the most easy-going autumn events in the area is the annual Friends Fall Festival (Downingtown Friends Meeting, 800 E. Lancaster Ave., Downingtown, 610-269-4223, www.downingtownfriendsmeeting.org) which is scheduled for October 10 from 9 a.m.-4 p.m.
At 2 p.m. there will be a re-enactment of the first wedding held in the Meeting House in 1806. Visitors can attend the wedding inside the Meeting House and have photographs taken with the bride and groom and wedding party — all of whom will be dressed in authentically reproduced early 19th-century Quaker garb. The festival, which also offers free parking, will feature live folk and rock music along with demonstrations and community exhibits. There will also be a variety of tasty food items available for purchase. The Wooden Ladle will offer homemade vegetarian chili, hearty vegetable soup, juicy grilled hot dogs, funnel cake and hot apple cider, coffee, or cold drinks. The Friendly Cafe, which is an indoor venue, features homemade pastries, pumpkin and apple pies, specialty teas, cakes and coffee. The Friends Mercantile, a not-to-be-missed stop for serious garage-sale shoppers, opens its doors at 9 a.m. and attracts a loyal following of shoppers with everything from fine gifts to children’s toys, books, housewares, jewelry, electronics, and more. The festival’s craft vendors offer everything from handcrafted needlework to woodcraft, leather, ceramics and more . The Hay Creek Apple Festival (Historic Joanna Furnace, Route 10, Morgantown, 610-286-0388, www.haycreek.org), which also has been around for more than 30 years, is scheduled for October 10 and 11. The festival is a celebration of autumn and especially autumn’s favorite fruit — the apple — with a long list of special activities and an amazing variety of taste treats featuring apples. If you’re driving around the West Chester area on October 11and you’re hit by the overwhelming aroma of spicy chili being cooked, there is a good reason. 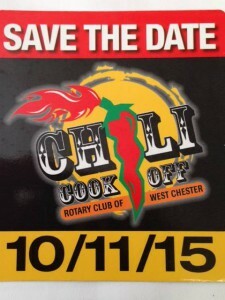 This Sunday, West Chester will be the site of a special event to determine who can make “The Best Darn Chili in Chester County!” — the site of the West Chester Rotary’s 13th Annual Chili Cookoff (Gay and High streets, Downtown West Chester, www.westchesterchilicookoff.com). All-you-can-eat wristbands are just $10. The Colonial Pennsylvania Plantation (Ridley Creek State Park, Media, 610-566-1725, www.colonialplantation.org) hosts an event called “Fall Flax and Textile Day” on October 10 from 11 a.m.-5 p.m.
Winter is coming and it is time to process flax and spin wool. The Plantaion’s weavers will be working on an 18th-century barn loom. Yarn will be dyed using authentic receipts. Visitors are invited to come see the horned dorset sheep and hog island sheep of the Colonial Plantation as well as the rest of its farm animals. There will also be hearth cooking, garden, farm, and house tours. Admission is $10 for adults and $8 for children (ages 4-12). Children under age 4 are free. Halloween activities are starting to fill up the area events calendar faster than ou can imagine. The following is a chronological look at many of these events. The 25th annual edition of “Haunted Hayride, Bates Motel and Haunted Corn Trail at Arasapha Farm” (1835 N. Middletown Rd., Gradyville, 610-459-0647, www.thebatesmotel.com) will be scaring visitors through November 1.The haunted hayride through the woods features monsters, special effects and actors. The Bates Motel has haunted rooms with special effects and computerized lighting. A haunted trail is cut through a cornfield inhabited by monsters. Admission prices are: Haunted Hayride, $20; Bates Motel, $15; Haunted Corn Maze, $15; combination tickets, $40. There are reduced rates for children. Featured attractions, which will continue until November 1, are “Abby Cadabby’s Magical Halloween Maze,” “Rubber Duckie Costume Party,” and “The Not-So-Spooky Hayride.” Admission to the park is $45. Pennhurst Asylum (100 Commonwealth Drive, Spring City, 484-866-8964, www.pennhurstasylum.com), which is open through November 1, is on the site of a former mental asylum which has been shuttered for over a quarter of a century. It has been transformed into a haunted attraction with huge sets, detailed rooms and live actors. Visitors can also explore the labyrinth of underground tunnels. Tickets are $16 for “Pennhurst Asylum”, “Dungeon of Lost Souls” or “Tunnel Terror,” $20 for “Ghost Hunt” and $45 for a four-event combo. “Hurricane Hill Farm Maze” (Baldwin’s Farm, 704 East Reeceville Road, Coatesville, 610-384-6952, www.hhfmaze.com) will be open Saturdays and Sundays until November 1. This event features miles of trails through a five-acre corn maze along with a corn slide, hayrides, a pumpkin patch and a farm animal display. Tickets are $13 for adults and children and $10 for seniors (ages 60 and over). Corn mazes, hayrides, a pumpkin patch and scarecrows will be featured at Ramsey’s Farm (500 Ramset Road, Wilmington, Delaware, 302-477-1499, http://www.ramseysfarm.com) on weekends now through November 1. The theme for the Corn Maze at Ramsey’s Farm this year is a trip around the world with sections for North America, Europe, South America, Africa, Australia and Asia. Tickets are $7 for the corn maze, $4 for the sorghum maze, $3 for the hay maze, $2 for pumpkin painting and $3 for a hayride. Another popular corn maze in the area is running now through November 7 at Cherry Crest Adventure Farm (150 Cherry Hill Road, Ronks, 717-687-6843, www.cherrycrestfarm.com). The main attraction is Cherry Crest’s “Amazing Maize Maze.” Billed as “the world’s most dynamic and interactive corn maze,” it is a five-acre corn maze with over two-and-one-half miles of paths, scenic bridges, and clues. There will also be a “Flashlight Maze” every Friday and Saturday night .Tickets are $17 on Thursday and Fridays and $20 on Saturdays. “Halloween Haunt at Dorney Park” (3830 Dorney Park Road, Allentown, 610-395-3724, www.dorneypark.com), which runs now through November 1, features scary creatures roaming the park and scarecrows lining line the walkways while frightening activities take place at the following attractions — “Fright Lane Including Skeleton Key,” “Chamber of Horrors” and “CarnEvil” along with seven mazes and four “Creepy Scare Zones.” Admission is $37. The “24th Annual Fright Fest” (Six Flags Great Adventure, Route 537, Jackson, NJ, 732-928-2000, www.sixflags.com), which is running now through November 1, features family-oriented activities during the day and much scarier attractions after dark for teens and adults including “Asylum,” “Blood Shed,” “Voodoo Island,” “Total Darkness,” “Wasteland,” “Circus Psycho,” “Bone Butcher Terror-tory,” “The Manor,” “The Bloody Fountain” and “Skyscreamer of Doom.” Tickets start at $49.99. Ghost Tour of Philadelphia (215-413-1997, www.ghosttour.com), Ghost Tour of Lancaster (717-687-6687, www.ghosttour.com) and Ghost Tour of Strasburg (717-687-6687, www.ghosttour.com) operate through November and offer an eerily entertaining evening of true ghost stories and real haunted houses. Tickets are $17 for adults for Philadelphia and $15 for Lancaster and Strasburg and $10 for children at all locations. The “30th Annual Jason’s Woods” (99 Stehman Road, Lancaster, 717-872-5768, www.jasonswoods.com), which is running through November 7, is a horror show complex that features a combination of live actors, impressive animation and scary special effects. Popular attractions include “Horrifying Hayride,” “Chamber of Horrors,” “Zombie Apocalypse,” “Lost in Jason’s Woods,” “Carnival of Fear,” “Fields of Fright” and the “The Grand Jason’s Woods Theater.” Admission prices are for combo tickets are $25 for three attractions and $40 for six. “Valley of Fear” (300 W. Bristol Road, Feasterville, 215-942-9787, www.valleyoffear.com), which is open through November 1, features four “heart pounding attractions” — “Haunted Hayride,” “UnderWorld,” Zombie Escape Maze” and “Operation Z Paintball.” Admission prices start at $19. “Terror Behind the Walls” (Eastern State Penitentiary, 2124 Fairmount Avenue, Philadelphia, 888-763-NITE, www.easternstate.org), which continues through November 7, takes place at a site Penitentiary that was once was an active prison and is now a National Historic Landmark. It is a scream-inducing event featuring laser and special-effect lighting, digital sound, sinister scents, animatronic creatures and 3-D illusions. Admission prices, which vary with the date, range from $13-$39. “Pumpkinland” (Linvilla Orchards, 137 West Knowlton Road, Media, 610-876-7116, www.linvilla.com), which is open through November 1, features fairy tale characters from nursery rhymes along with a huge scarecrow and a really tall storybook. Other activities include train rides, a straw bale maze, hayrides, pick-your-own apples and pony rides. Another attraction, which runs through October 30, is “Hayride to the Witch’s House.” Admission is free and hayrides are $9 per person. “Field of Screams” (Stone Battery Road, Lancaster, 717-285-7748, www.fieldofscreams.com), which is open now through November 9, features “Den of Darkness” (three-story horror house), “Frightmare Asylum” (walk-through haunted barn), “Extreme Blackout,” “Nocturnal Wasteland” and the “Haunted Hayride” (a 25-minute fright-filled ride featuring state-of-the-art special effects, pyrotechnics and animatronics). Admission is $34. “Candlelight Ghost Tours” (Fort Mifflin, Fort Mifflin and Hog Island roads, Philadelphia, 215-685-4167, http://fortmifflin.us) are scheduled for October 17, 24 and 30. Visitors can tour historic (and haunted) Fort Mifflin by candlelight from 7-10 p.m. each night and hear true stories of ghostly encounters. This event is billed as an “authentic experience.” Tickets are $20 for adults and $15 for students (12 and under). October 17 and 24 are the dates for “Ghosts in the Graveyard” (Old Swedes Historical Site, 606 Church Street, Wilmington, Delaware, 302-652-5629, www.oldswedes.org). From 6:30-9 p.m. each night, visitors will be able to stroll through the complex, meet some of the ghosts who reside in the site’s burial grounds and maybe even solve the mystery of the late night bell ringing at Old Swedes Church. Tickets are $10 for adults and $6 for students (ages 12-17). The “Great Pumpkin Express Trains” (West Chester Railroad, Market Street Station, West Chester, 610-430-2233, www.westchesterrr.net) are scheduled for October 18 and 25. The “haunted trains” with ghoulish characters leave West Chester’s Market Street Station at noon and 2 p.m. Tickets are $18 for adults and $15 for children. “West Chester Halloween Parade” (Market and Church streets, West Chester, 610-436-9010, www.west-chester.com), which is slated for October 28, starts at 7 p.m. on Market Street between Church and Darlington streets and features performances by local high school bands and cheerleading squads. Rain date is October 29 at 7 p.m.
From October 22-24, “The Great Pumpkin Carve” (Chadds Ford Historical Society, Route 100, Chadds Ford, 610-388-7376, www.chaddsfordhistory.org) will return to its annual haunt. The popular event will start with the carving competition on October 22. Live entertainment, hayrides and hot food are featured all three days. Admission is $10 for adults (18 and older) and $5 for children (ages 7-17). “Boo at the Zoo” (Brandywine Zoo, 1001 N. Park Drive, Wilmington, 302-571-7747, www.brandywinezoo.org) will be held on October 23 and 24 from 5-7:30 p.m. each night. The popular annual non-scary family event features games, animal enrichment programs, live critters and trick-or-treating. Children (and their grown-ups) are encouraged to wear costumes. Tickets are $4 for adults and $2 for children.